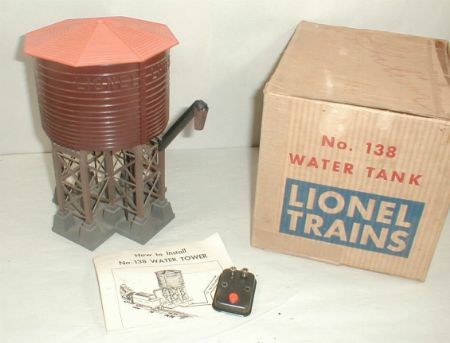 Lionel reintroduced the 30 water tower in 1953 as the 138 water tower. The 138 is the same as the 30, except the 138 has a plastic base. The 138 water tower first came with a gray roof. Later versions came with an orange roof as shown here. When a 90C controller is pushed the spout lowers. Lionel has made similar water towers in the modern era. I think MTH also makes a copy of the 138. Lionel added a stop mechanism to the popular 112 station in 1935 and called it the 115 stop station. The station can be found with two different shades of red. Either lighter red as seen here, or a slightly darker shade of red that was produced only in 1935. This station is the same as the Lionel 117, but has added lights beside the doors. The station was made in the postwar period. It’s the largest Lionel station made after the war. Reproductions of this station have been made. Clean examples like the one shown above will bring a large premium. 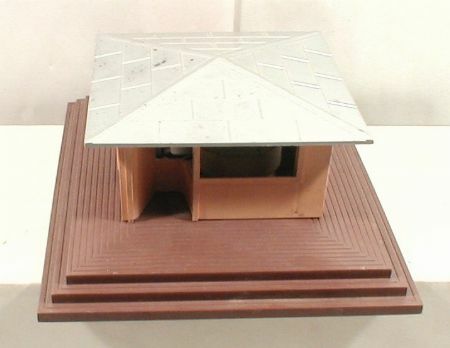 This is a simple building with a battery operated horn inside it. Lionel made the 114 news stand with horn from 1957 to 1959. There are no variations. The station shown here should have white plastic windows in it. 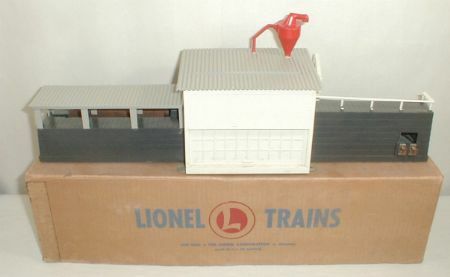 This was also sold with a whistle as Lionel 118, and the building itself was used on the Lionel 415 diesel fueling station. Lionel has also made the 114 newsstand in the modern area in different colors. This is a fun postwar accessory. A log car dumps logs into the tray on the right. When the 464 saw mill is turned on, the logs are pulled into the building and finished lumber comes out on the left. The lumber is loaded into the mill using the slot on the roof. The back has a door to get the logs out. 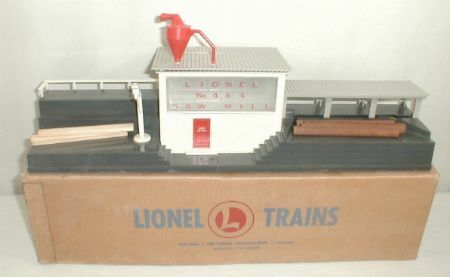 Lionel made the 464 from 1956 to 1960. There are no variations. 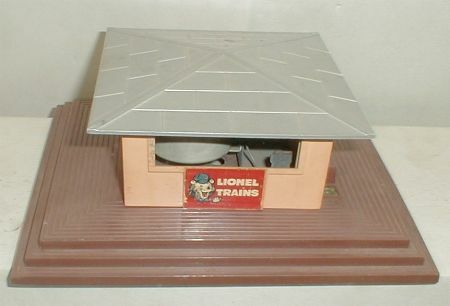 This unit has been reissued by Lionel in a number of colors and numbers since 1980. 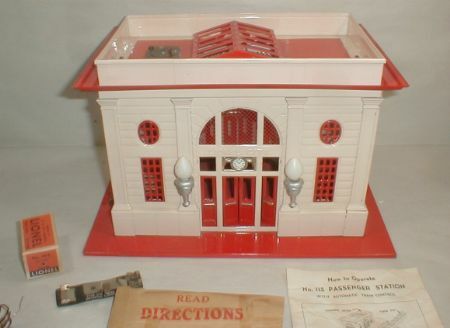 When found, the red sawdust collector on the roof is missing or broken. Replacements are available. 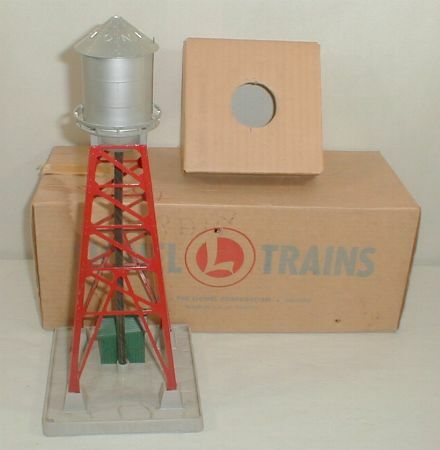 Lionel made the 193 industrial water tower from 1953 to 1955. The light on the top of the tank blinks. There is supposed to be a red lens on the top of the tank. It’s the same part as the lights on the 252 crossing gate. The tower comes with either red or black or black sheet metal structures. Red is shown above. Black brings a premium. Copies of this tower have been made recently by Lionel and MTH. American Flyer made this interesting accessory for only three years. Catalog number 23791 cow on track. 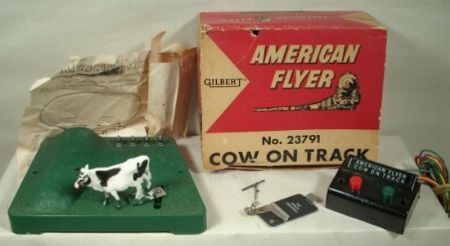 The operator pushes the red button on the controller and the cow swings out over the track. The train stops before hitting the cow. When the green button is pushed the cow swings away from the track and the train starts up again. Many of these when found are melted. There is a resistor under the green base that blocks off most of the current so the reverse unit won’t cycle. If the cow is left over the track for long periods of time, the resistor gets hot and melts the base. You are currently browsing Postwar Accessories toys.